Installing bamboo edging is one of the easiest weekend projects that you can do to beautify your front yard. 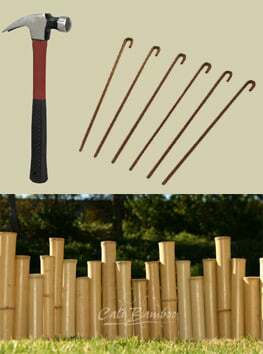 The only tools you will need is a hammer, some 8inch hook stakes, and some Cali Bamboo® edging. Simply measure the area you want to cover or enhance such as your walkway or tree box. You can lightly dig out a 1-3 inch trench where you plan to put your bamboo edging. Remember, that curves are fine as the bamboo will bend to any shape due to the flexible wire holding it together. Place the bamboo in the trench and use hook stakes (not included) to secure the steel wire between the bamboo into the ground. Use a hammer to gently hit the stake and catch the wire. You will only need 3 stakes per bamboo edging section to properly secure in place. Unfortunately, we no longer sell bamboo edging.